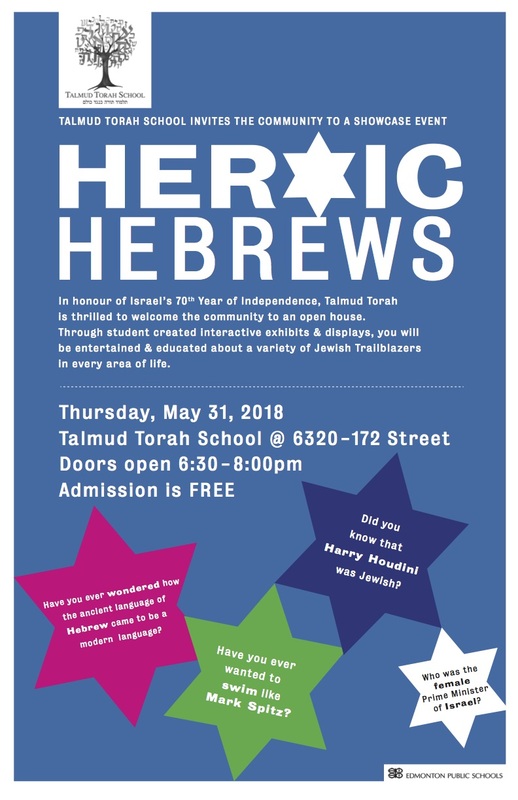 On Thursday, May 31st, Talmud Torah School will open its doors to the community for a special tribute evening to Jewish trailblazers, in honour of Israel’s 70th anniversary. This is a free evening, from 6:30 – 8:30 p.m., and will feature wonderful student exhibits and engaging, interactive displays. Additionally, you will be able to enjoy a spice shuk, a candle making factory, and a Virtual Reality tour of Israel. There will also be samplings of Israeli foods, at the “Tel Aviv Cafe” and student historical interpreters to guide people along in their exploration of all of these exciting activities. We look forward to welcoming the entire community!